Life was definitely on the sweet side for the guests at this year's Calgary Opera Gala. This fundraising dinner is always themed to the Opera and this year was an Italian theme inspired by La Traviata. The stage was filled with the beautiful set and the lobby was inspired by the Federico Fellini film 'La Dolce Vita' with graphic black and white. The evening was a feast for all the senses with beautiful music from Calgary Opera's Emerging artists on stage and Karl Roth during dinner. The lobby morphed into an elegant dining toom thanks to the lighting wizardry of Stardust Event Group and One West Events. The centrepieces were like glittering jewels at each table from Philip Chong set on crisp black and white damask linens from Linens Etc. We love being part of events like the Opera Gala. These special evenings are more than the sum of their parts. Everything comes together to create such a memorable experience for guests and the people behind the scenes. And the drama is wonderful! As I have said many times before, there are no formal kitchen facilities at the Jubilee and this means that the Devour team has to be extremely creative when designing the menu and then executing the final preparations on site. We insist on preparing as much as possible at the site and right before service to ensure the food being served is as fresh as possible and has not been sitting in hotboxes all afternoon. The menu was ambitious, but we really wanted to wow guests and serve items that are not often seen at large sit-down dinners like this. The five-course wine-paired menu is in a previous post about the tasting we held prior to the dinner. 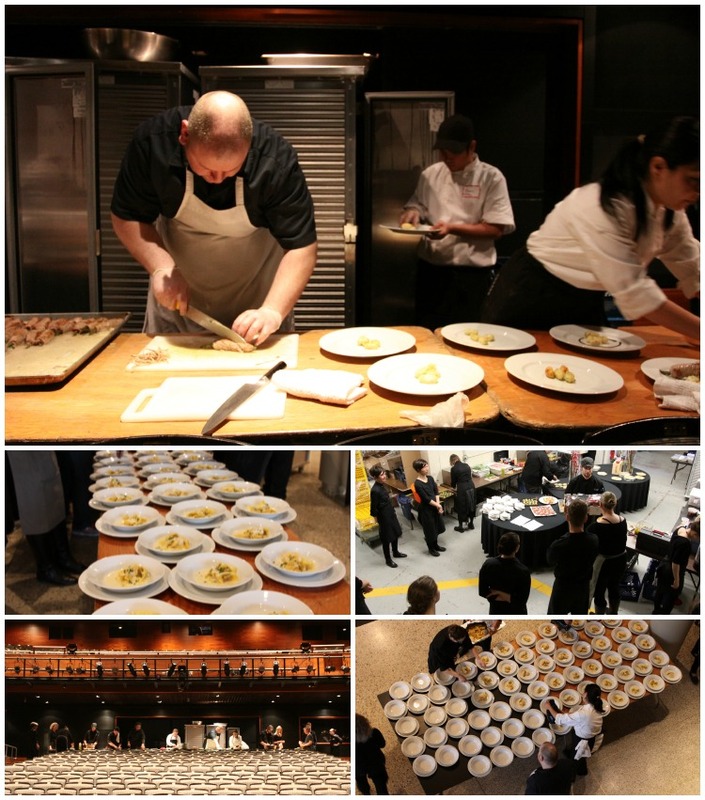 The backstage of the auditorium, the loading dock area, the north lobby, and even the back of the actual mezzanine area behind the seats were each transformed into a 'pop up' kitchen for each course during the evening. A huge congratulations to every person on the Devour team that evening for an amazing production. With no formal kitchen at the Jubilee - we had to get creative about where we could create each course. Congratulations to Calgary Opera on another successful event. We are so lucky to get to be part of it. To see more photos of the evening, be sure to check out our 'Behind the Scenes' board on Pinterest and Facebook page. Happy Spring and thanks for reading! Older PostBig Night. Big Screen. Big Smiles.